It seems that Ferrari are a bit annoyed that word of their now-famous "hole in the nose" of the F2008 leaked months ago. The first news of the innovation appeared in the Italian magazine, Autosprint, in February, long before the idea was tried on the track, and apparently very few within the company knew about it at the time. That should help the team to identify the source of the leak but it also raises questions about the espionage saga of last year. Not much notice has been taken of Nigel Stepney's statements since he was sacked from the company but the possibility that he has been truthful all along now raises its unwanted head. He has said that he did not release anything like as much information as was claimed, insisting that there were others who were stealing from the company at the same time. That might well include the famous Ferrari dossier, Stepney having denied that he was responsible for its transmission to Mike Coughlan. Ferrari has ignored the possibility of there being leaks beyond those caused by Stepney but now it seems that they are forced to reconsider. There is no way the "nose hole" leak can be blamed on the disgraced engineer. This brings home an aspect to the affair that was always glossed over by the FIA in its investigation - the fact that Ferrari security is a good deal less effective than it should be. In a sport where industrial espionage is a crime so serious as to be worth a $100 million fine, there is a responsibility on the originating company to guard its secrets effectively. The plain fact is that security in Ferrari is a flexible thing anyway. The quantity of information that was leaked to the Italian press before and during the WMSC hearings made that very clear. Those leaks were probably intentional, designed as they were to stir up anger at McLaren, but they are also indicative of a company culture that sees the positioning of information as a useful tool in achieving its ends. In such a culture, it is hardly surprising that leakages occur that are not beneficial to the team. Once employees have seen that the judicious release of information is acceptable in some cases, it is natural that they should include such methods in any scheme to benefit themselves. If Ferrari have been bitten by their own lack of interest in effective security, it is tempting to say that they have only received what they deserved. As for the nose hole itself, it is unlikely to be the huge step forward that the Barcelona test times would seem to indicate. Massa's extremely quick lap was set on slick tires with 2008 downforce settings whereas McLaren's time on slicks was spent with 2009 low downforce settings. The idea is not new, anyway. Patrick Head has mentioned that it is the same notion they were trying with the walrus nose Williams - they merely removed the upper bodywork over the channel of air from the front wing instead. Ferrari's solution may be a little more effective in that covering the channel enables the airflow to be better controlled but, as demonstrated by the Williams experiment, any advantage gained will be minor. It is the same with many of the tweaks introduced by F1 teams over time. For instance, the wheel inserts brought in by Ferrari were slow to be copied by other teams mainly because the advantage they gave was minimal. One team that could afford to have such a tweak, BMW, still has not bothered with the idea (although you can bet they have tried it in the wind tunnel). That surely must indicate that the inserts work well enough on some cars to be worth the expense and effort of designing them, but are less effective on others. The same is likey to be true of the nose hole, although it may concentrate the aerodynamicists' thoughts on that area. We might well be in for a period where several different solutions are tried, perhaps even a rebirth of the walrus nose! And, talking of rebirth of ideas, the nose hole idea goes back much further than the Williams FW26 of 2004. 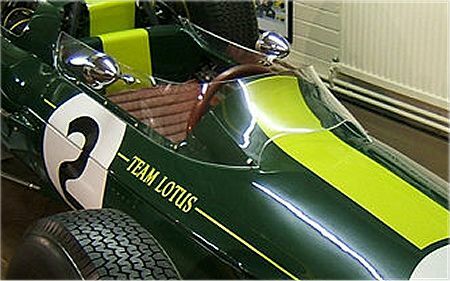 The principle was first seen in F1 in the shape of Colin Chapman's design for the windshield of the Lotus 25 in the mid-sixties. It may, in fact, be the first attempt to shape the airflow rather than just to make the car as slippery as possible. One could argue nothing is innovative as they have all been tried before in one application or another. But, I do think the refinement process of ideas is important. When people landed on the moon, they were not doing anything more then expanding on the flying process and taking it to new heights. The light bulb was an expansion of the match, etc., etc. Some people believe it is not where you start, but, where you finish. I see the 'nose hole' as very different then the 'hole' in the windshield of the Lotus. It releases pressure form under the car. The windshield improved airflow above the car. Same idea, different application and different results. I agree that the most important thing is the final result and not the original idea, Aracer (incidentally, Chapman's windshield cannot have been all that useful since it was not copied and soon disappeared off the Lotus). But it's interesting to look back and see where some ideas have come from. I agree with reducing the high pressure under he nose as the benefit. I don't see it doing much to the rear wing if it exits right in front of the driver and airbox. It may help the airbox, but, aren't they limited as to how big an opening they can use? I suppose it could help, but I'm with you Clive. I like the idea of it being an Allen key, Peril, but it's actually a pitot tube. It's hollow and the airflow builds up pressure inside, from which the airspeed can be measured. All the cars have them, usually just ahead of the cockpit, and you will see other sprouting in all sorts of unusual places during testing. 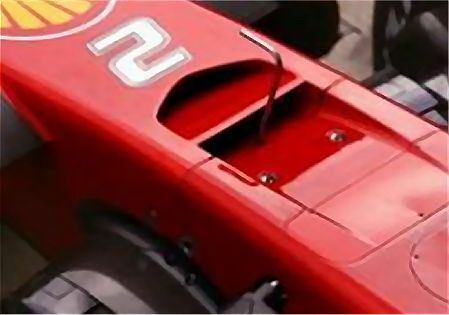 The Ferrari nose air outlet is designed to relieve high pressure air from under the nose, and should work. The Lotus 25 windshield design was a different concept altogether, intended to deflect air over the driver's helmet to reduce buffeting. It did not work well and was not used in the Lotus 33, the 25's successor, or any other F1 Lotus. Agreed that the nose hole is intended to relieve high pressure under the nose, Green Flag, but the similarity to the Lotus design comes in when a decision has to be made about what to do with the air released from the high pressure area. And the Ferrari engineers have taken the obvious option of directing it over the driver's head and at the airbox. Come to think of it, the idea is even closer to Chapman's intention than I had realized! I would love to know why F1 cars need pitot tubes. Since they first appeared I have been baffled as to why. I know thye measure air speed and there are one or two obvious things can be gained by knowing that but i can't think of one good reason why I would design one into a racing car. I can only presume that the pitot tubes provide useful information to the aero boys, Steven. Perhaps now that strenuous efforts are being made to lessen the importance of aerodynamics in F1, the pitot tubes will disappear. Clive, the two design concepts are diametrically opposed - Ferrari are relieving high pressure air under the nose to increase downforce, they are not intentionally directing the escaping air into the airbox; none of the air escaping from the nose outlet will ever reach the airbox as it will be "overpowered" by high speed air flowing over the car. Lotus, on the other hand, wanted to create a high pressure air stream (using the Bernoulli principle to force air between the Perspex windscreen and the cockpit/bodywork air deflector) to direct headwind over the driver's helmet to reduce head buffeting caused by the headwind. The two ideas are hardly diametrically opposed, Green Flag when both are concerned with shaping the airflow. Granted that the prime reason for Ferrari's innovation is the release of a high pressure zone, but the aero boys must still concern themselves with what happens to the air once released. Plenty of F1 watchers think (erroneously in my opinion) that the idea is to direct air more effectively at the airbox and rear wing and they are right at least in that escaping air needs to be directed to assist rather than hinder overbody aerodynamics. You can bet that Ferrari have looked very carefully at how they can shape the flow from the upper nose hole to best serve existing downforce generators. "BMW, still has not bothered with the idea (although you can bet they have tried it in the wind tunnel)"
the front ones featured a slightly different configuration from other teams. i suspect the reason they're not used is the pitstop comprises required makes it all a bit risky.